A group of cells with common origin is called a tissue. The cells of a tissue usually perform a common function. There are two main types of plant tissues, viz. meristematic tissue and permanent tissue. The cells in the meristematic tissue have the capability to divide. Meristematic tissue is found in growth regions of plants, e.g. root tip, shoot tip, buds, etc. The meristematic tissues are further divided into two types, viz. primary and secondary meristems. Primary Meristems: The meristematic tissues which appear early in the life of a plant and which are responsible for the formation of primary plant body; are called primary meristem. There are two types of primary meristem, viz. 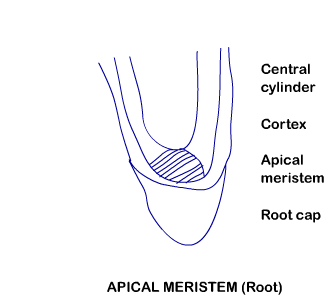 apical meristem and intercalary meristem. Apical Meristem: As the name suggest, the apical meristem is found at the apex of root and stem. During the formation of leaves and elongation of stem, some cells of the apical meristem are left behind from the shoot tip. These cells constitute the axillary bud. Axillary buds are capable of forming a branch or a flower. Intercalary Meristem: The intercalary meristem is found between mature tissues. In grasses, the intercalary meristem helps in regenerating parts which were removed by the grazing animals. The newly formed plant cells become specialized and lose the ability of cell division. Such cells are called permanent or mature cells and form the permanent tissues. There are two types of permanent tissues, viz. simple tissue and complex tissue. Simple Tissue: All the cells in a simple tissue are of only one type. 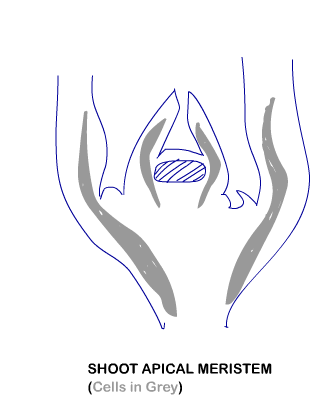 Simple tissue is further divided into three types, viz. parenchyma, collenchyma and sclerenchyma. Parenchyma: The cells of parenchyma are usually isodiametric. They can be spherical, oval, round, polygonal or elongated in shape. 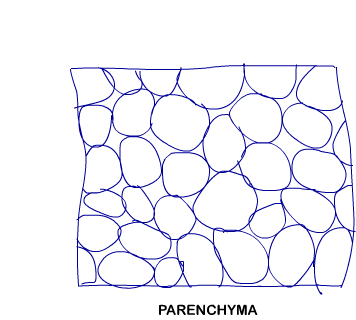 The cell wall is thin and is made up of cellulose. Cells of parenchyma are either closely packed or have small intercellular spaces. Photosynthesis, storage and secretion are the main functions of parenchyma. Moreover, the bulk of the plant is made up of parenchyma. 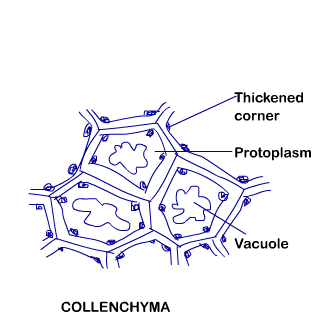 Collenchyma: Cells of collenchyma are thickened at corners because of deposition of cellulose, hemicellulose and pectin. The cells can be oval, spherical and polygonal. Collenchyma is present in layers below the epidermis in dicotyledonous plants. Collenchyma provides mechanical strength; along with flexibility to certain plant parts, like stalk of a leaf. Sclerenchyma: The cells of sclerenchyma are long, narrow and have thick and lignified cell walls. There can be a few or numerous pits in sclerenchyma. Cells of sclerenchyma are usually dead with our without protoplast. 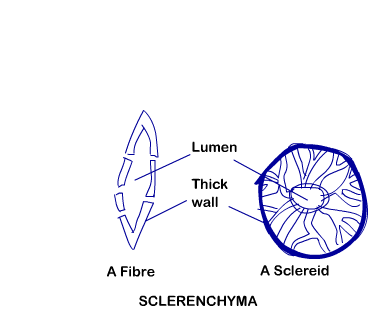 Sclerenchyma can be either fibres or sclereids. The thick-walled elongated and pointed cells in sclerenchyma are called fibres. The fibres usually occur in groups. The spherical, oval or cylindrical cells with very narrow lumen; in sclerenchyma are called sclereids. Sclereids are usually found in the fruit walls of nuts, pulp of fruits like guava, pear and sapota; seed coats of legumes and leaves of tea. The gritty texture of pear or guava is because of sclereids. The main function of sclerenchyma is to provide mechanical support.